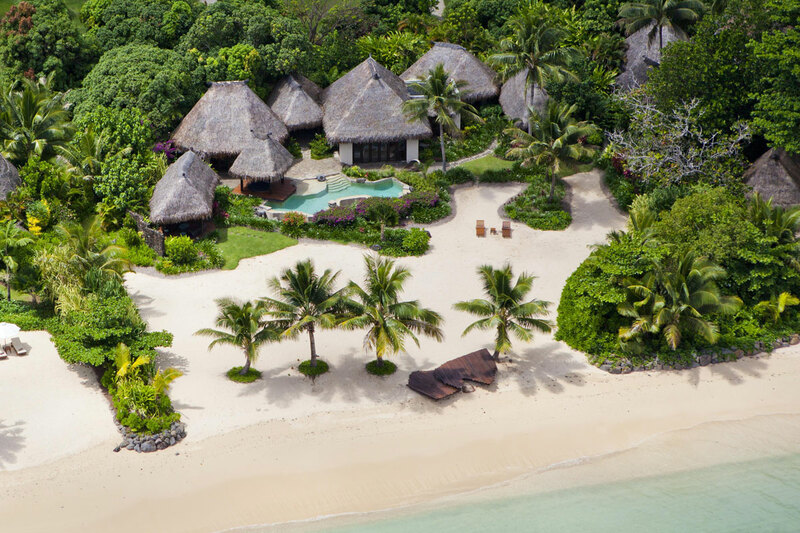 The architectural design of Laucala Island reflects a seamless transition between built areas and the untouched beauty of the island. 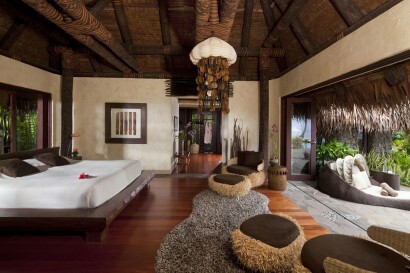 Based on traditional Fijian building techiniques the resort construction utilized local timber, thatch and stone. Integration of outdoor and indoor living spaces provides the guest with the luxury of totaly privacy and total exclusivity. Each residenceis individually named after a certain characteristic of its setting. 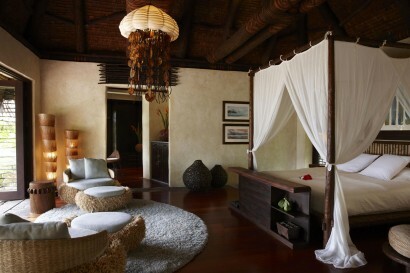 Unique pieces that engage guests luxuriously with local crafts and culture make up part of the exquisite interior designs in all villas and guest facilities such as jelly fish chandeliers with silk shades and braided coconut sinnet ‘tentacles’ and doors with rustic carvings to name a few. These innovative and memorable design pieces were inspired by the island it selfusing local, natural, sustainable materials that generate an unforgettable sense of place that reflects the culture of Fiji. Laucala Island was one of a few islands sold to early European settlers in the late 1800s by the 8th Paramount Chief (‘The Tui Cakau’) of the Cakau drove Province. Mr John Rosa was the owner of Laucala since 1869. The island contained over 3000 acres, 600 of which was mainly copra plantation. Cattle, pigs and poul try were also reared on the island. He is buried with his family on the island. In 1972 publishing magnate Malcolm Forbes purchased the island and upon his death in 1990, his ashes were buried on the island. 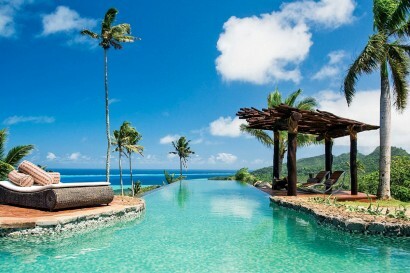 In 2003 Dietrich Mateschitz acquired the island from Forbes heirs ; construction began in 2005 and Laucala Island opened in December 2008. He has sincere stored and renovated the island, upgrading the residences to a new level of luxury using integrated ecofriendly building architecture and unique structures. His passion towards the island’s beauty and nature created a vision of a special place in this world – a seamless transition between cleverly designed residences and the untouched beauty of the island. A place rich in culture and diversity that reflects the soul and spirit of the island. Our integral philosophy encompasses the whole island, growing our own live stock and vegetables, caring for our own environment and hand making all our own guest products using the islands natural resources. 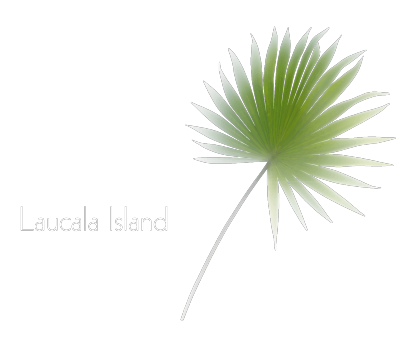 We have tried to preserve the integrity and history of Laucala in this way. All villas and resort facilities under went major maintenance and refurb works from March 1, 2010 and reopened June 1, 2010; and from Jan 2014 to end of March reopening April 1, 2014; and in Feb 2015 for a month which saw the completion of cobble stone roads through the entire resort property. All interior design was carefully selected and appointed by Lynne Hunt London team. In 2017, we closed on Oct 9th to carry out minorre furbworks in all villas and guest facilities and also reinstalled 2 new generators for the island. We reopened on Nov 9th after a month of thorough clean up, maintenance works and staff intensive training. 25 spacious villas with its own swimming pool where guests can enjoy complete privacy, day and night Category 4 private airport, a David McLay Kidd designed 18 hole Championship golf course, a wellness spa, 25 marine vessel fleet plus a Deep Flight submarine, 5 restaurants and bars, a cascading lagoon pool and lap pool with glass front in the centre of the resort, a self-sustainable island with its own organic and hydroponic farms, highest number of staff to guest ratio ensuring every guest need is anticipated and demand met. 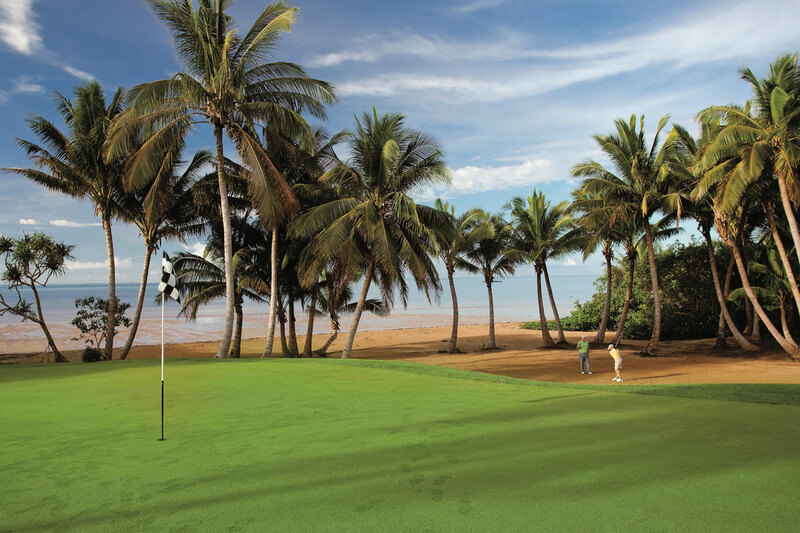 In the northern part of Fiji (Cakaudrove Province) lying east of Thurston Point on the island of Taveuni , the Garden Island of Fiji and also near Qamea Island and Matagi Island. • Enjoy the many water sport activities on offer including a scenic dive in our Deep Flight submarine. We also cater to families and provide a kids club and nanny service. Kids age range from 0-16 years. 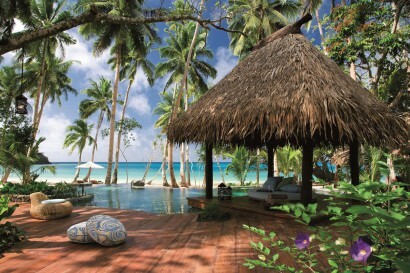 • Plantation Villas are incorporated into the old coconut plantation positioned on a private beach area. Each of the (6) one-bedroom villas, (4) two-bedroom villas and (1) three-bedroom villa offer their own pool, hot tub, sundeck and indoor/open-air lounge. • Plateau Villas are situated on Nawi Mountain, offering unforgettable views out to sea and across the neighboring islands. The open-air design plans for (3) one-bedroom villas and (1) two-bedroom villa unify the boundaries between the interior and exterior areas, providing an exceptionally secluded locale along the ridge. • Seagrass Villas are discreetly nestled under the opulent green of Seagrass Bay’s coastline. A remarkable combination of vast space, exclusively designed interiors, natural materials and luxurious comfort create an inspiring ambiance for nature lovers in each of the (4) one-bedroom villas, (2) two-bedroom villas and (1) three-bedroom villa. • The Overwater Villa is the epitome of paradise, elevating the resort to a work of marine art. 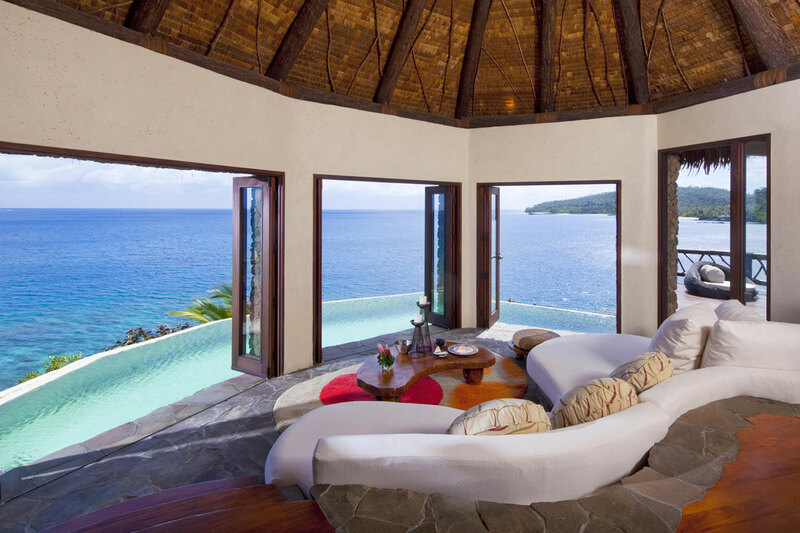 This two-bedroom villa appears to float above the emerald-green lagoon, allowing guests to reside in luxury over an omnipresent ocean whether relaxing on the spacious terrace, bathing in the hot tub, or swimming in the large private pool which is carved directly into the rocks of the shore. • The Peninsula Villa is a luxurious mansion that resembles an “island on an island” surrounded by opulent green hills, a white beach, the dazzling waters of the South Pacific and plenty of space for privacy. 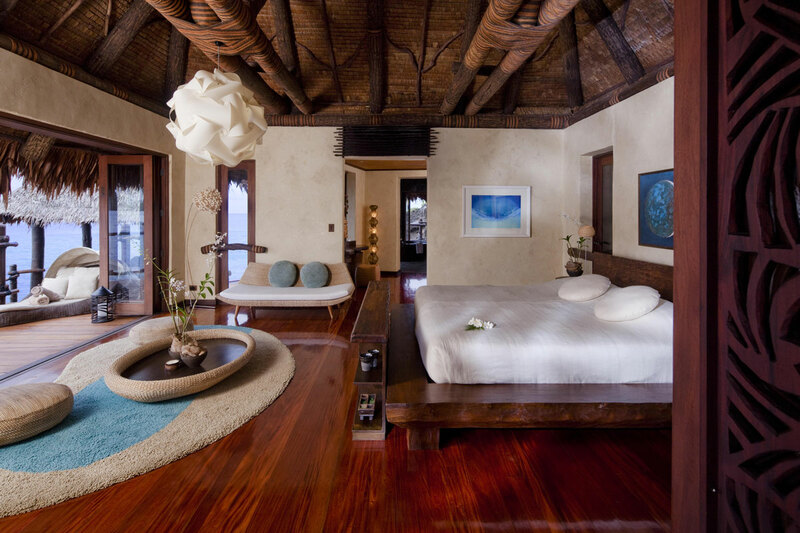 The villa’s spacious living areas are connected by wooden bridges that offer spectacular views from every angle. 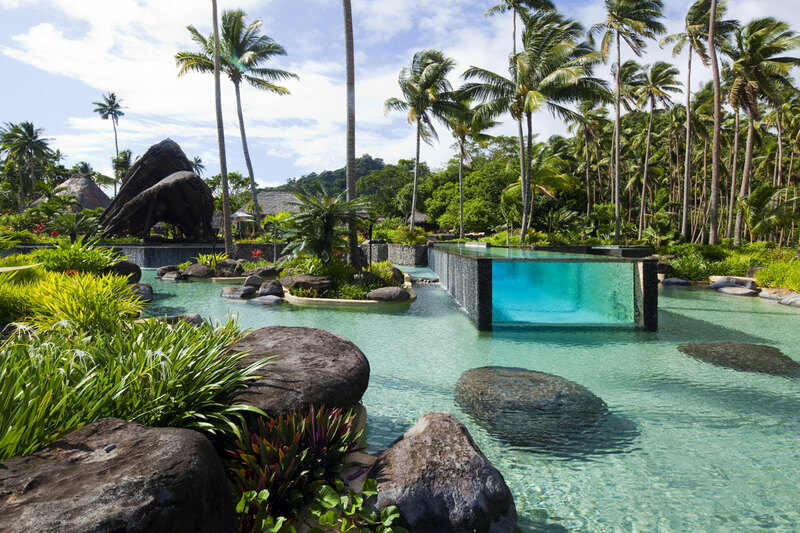 The private pool, concealed beach and jetty guarantee undisturbed privacy, the marker of the genuine luxury of Laucala Island. • The Hilltop Villa is likened to a “resort within a resort,” situated a top the high green hills of the island, shining as the crowning gem of Laucala. The captivating views, unique atmosphere, and unusually designed main villa with its own panoramic view, landscaped garden and two spacious guest villas all work together to form one oversized private “estate” on the hill top. The main villa features a master bedroom, lounge, dining room, library, outdoor pavilions and lap pool, and two one-bedroom guest villas feature one separate pool and private kitchen area. Room amenities include air condition, 24hr room service, fully stocked mini bar and health bar, daily laundry and dry cleaning services, nanny service on request, electric buggy, private pool, yoga deck, satelite TV and in-house movie channels in bedroom and lounge, iPod and iPhone docking station, Bose home entertainment system, wireless internet, 1 complimentary 60 min massage per adult (18yrs & over), hair dryer, bathroom amenities and electronic safe. Included in the room rate are all meals, house wines, champagnes and spirits, inner reef water sport activities and land activities, Deep Flight submarine dives, cooking classes, kids club, gym and fitness classes and spa classes. • Romantic candle light dinners on the private beach, fine dining in the Plantation House Restaurant, authentic Asian delicacies in the Seagrass Restaurant, spectacular sundown cocktails in the Rock Lounge, avant-garde fingerfood at the Pool Bar and barbecues at the Beach Bar all capture the tropical atmosphere and provide a broad variety of culinary rarities that fulfill every wish. A superbly stocked wine cellar on property acts as a treasure trove for the most discerning of oenophiles. • Plantation House Bar &Restaurant, located in a mansion replicated in the original colonial style, provides a fine dining experience that incorporates the experience of a professional, international team with excellent gourmet dishes and an exceptional wine list featuring older vintages and “New World” options. Cooking classes and show kitchen are also available. • SeagrassBar Lounge & Restaurant, available by land and boat, offers a perfect combination of top-quality cuisine á la Laucala Island with a distinct Thai touch. Set against panoramic views, with a sensuous atmosphere, specialties include Teppanyaki barbecue and authentic Asian dishes, introducing a taste of the Far East to Laucala Island. • The Beach Bar offers a relaxed atmosphere where fine white sand, blue sunny skies, crystal clear water and freshly caught and barbecued fish come together, creating the perfect beach setting. 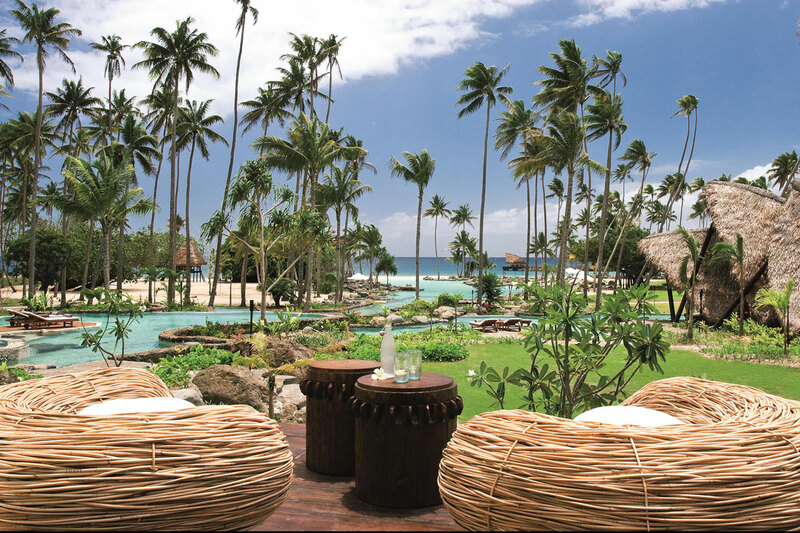 • The Pool Bar provides a Fijian avant-garde experience where imaginative design in the form of off-the-wall architecture combines with tropical drinks and light, modern Mediterranean cuisine. 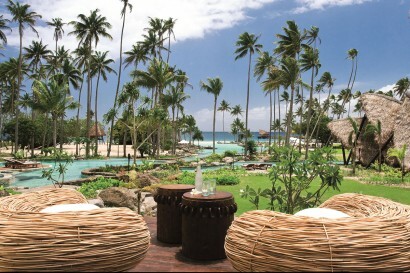 • Rock Lounge is comprised of scenic views overlooking Seagrass Bay, spectacular sunsets, an ingeniously designed “chill-out” atmosphere and exceptional drinks and cocktails. • Our culinary professional team is headed by our Executive Chef, Jean Luc Amann from France. 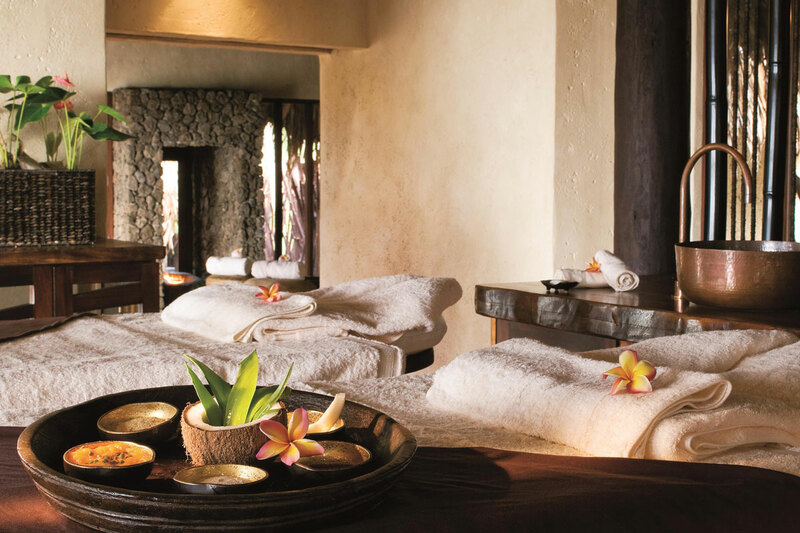 Our wellness spa features 4 private and secluded treatment suites with shower and change rooms, double treatment massage facilities and open views from the cliff top out to the open sea; stepping out of the relaxation room into the garden you wil find an open air bathtub with a striking view. All spa amenities are createdf rom local flowers and herbs grown in our spa gardens. 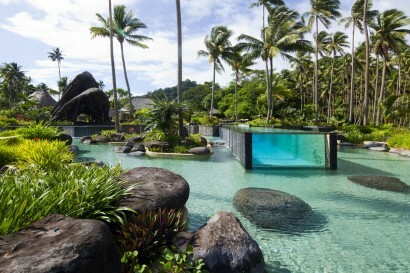 We have a massive sand lagoon pool and a lap pool in the centre of the resort. 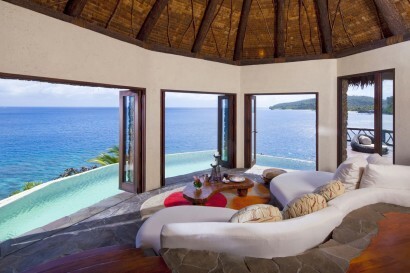 Each villa has its own private plunge pools. We also offer a gym and fitness centre for guests.